Sometimes one flowers is all you need! 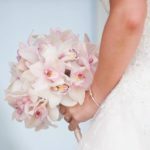 This beautiful bride’s bouquet is filled with cymbidium orchids with hints of pink and purple for a classic and romantic look. To view more wedding floral bouquet ideas, please click here.